This is such a darling little girl! This antique postcard has the prettiest pastel tinted touches on it, including the flowers, the trim on the girl’s eyelet dress and the blue socks peeking out of her high button shoes. Vintage Flowering Bulb Image! 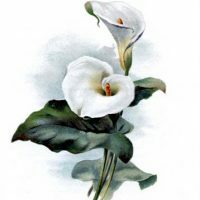 Vintage Botanical Graphic – Cala Lily 3 Vintage Botanical Flower Images! I love it! The pastel tints are perfect! I love tinted cards like that! I just stumbled onto your blog while looking for some clip art for a project. You have some beautiful artwork here! So beautiful! Thank you so much!